A monograph is a written document, or standard, that describes an item (e.g., a finished drug, a drug ingredient, impurity or excipient). Many of the existing pharmaceutical and biopharmaceutical assays (e.g., those from the United States Pharmacopeial Convention [USP], and other pharmacopeias) are time consuming, labor-intensive, involve hazardous chemicals, require extensive analyst training, and may yield significant measurement errors. In recognition of this the USP embarked on a monograph modernization initiative, aligned with the methods in other pharmacopeias and the International Conference on Harmonization (e.g., ICH Q3A and Q3B), and current FDA guidance. Ion chromatography (IC) plays a key role in drug monograph modernization because it offers a significant improvement to existing active pharmaceutical ingredient, impurity and counterion assays, with advantages in speed, reproducibility, accuracy, safety and cost-effectiveness. 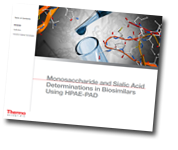 This learning portal, produced in collaboration with Thermo Fisher Scientific, provides learning content, advice and guidance for the transition to modernized pharmacopoeial methods using IC. Discover the unique benefits of modern ion chromatography systems for the analysis of pharmaceuticals and biopharmaceuticals. This application book covers how high-performance anion-exchange chromatography with pulsed amperometric detection is a very useful tool for glycan analysis. HPAE-PAD separates carbohydrates with specific interactions between the hydroxyl and carboxyl groups of carbohydrates based on charge, size, composition, isomers, and linkages. Methylamine or monomethylamine (MMA) is widely used in different stages of the preparation of various drug substances and may be retained in the drug substance as process-related or degradation impurities. The work shown here uses a RFIC system with suppressed conductivity detection to determine MMA in drug products. The method separates MMA from other cations typically present in drug products. This whiteboard video describes the basics of ion chromatography such as the choice of column, sample injection, generalized system setup, and detector choices. In addition, there is an introduction to the latest ion chromatography system available from Thermo Fisher Scientific.